We all like to try something before we buy, to get an idea of what we’re investing both our time and money in. Below you can download the complete scope and sequence documents from all four levels of Inspired to give you an overview of the course contents at each level. We think that it is important for you to be able to see just how great the material is and how it works in class. 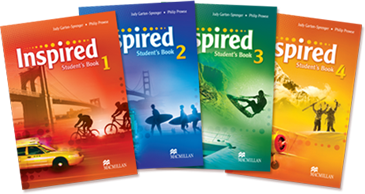 We’ve therefore made available to you a complete sample unit from each level that includes: Student’s Book pages, Teacher’s Book teaching notes, Workbook pages and the listening materials for the unit. Print them out and try them with your next class. We’re confident that both you and your students will love them.